Shotguns need to be cleaned like any other tool or item that you use frequently. Some gun owners just don’t realize that every time they fire their shotgun, it leaves a little bit of residue inside the barrel, action, and chamber of the gun. This residue is actually made up of tiny particles called “fouling” which come from the shells that you’ve fired. The fouling particles are generated from the used birdshot, buckshot, slugs, wad, and gunpowder. Each time you fire a shell, a little bit of this residue is left behind inside the shotgun. If you don’t clean up the residue on a regular basis, it will build up over time and eventually impair the functionality of the weapon. In addition, excessive sweat and moisture build up in the shotgun could cause the weapon’s metal parts to become corroded. Once this happens, these parts of the gun will become rusty and cause your gun to malfunction. There are four types of fouling you’ll commonly find inside a used shotgun; carbon, copper, lead, and plastic. Carbon comes from the burnt gunpowder which is used to propel the ammunition out of the chamber and through the barrel. You don’t usually see the carbon particles, but they spread inside the chamber and even get on the shooter’s hands. Copper particles may be there after you shoot if the slugs are jacketed with copper (sabot slugs). 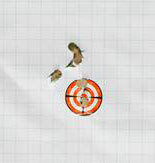 As for the projectiles inside of the shotshells, they are all typically made out of lead material. This means when you fire the shotshells in your shotgun, lead residue from the projectiles will get left in your barrel after you fire them. And finally, the plastic from the wads of the shells will create plastic residue that gets left behind as well. When searching for the best shotgun cleaning kit, there are three cleaning kits in particular that you should pay attention to because they are affordable and highly regarding amongst gun enthusiasts. They are the Beretta Shotgun Cleaning Kit, the Tetra ValuPro III Shotgun Cleaning, and Hoppe’s No. 9 Cleaning Kit. All three of these cleaning kits can be purchased online and shipped right to your doorstep. Some of these cleaning kits cater to specific shotgun brands and calibers while others are more versatile and can be used to clean multiple types of shotguns. But no matter which one you choose, it will certainly be worth the investment in order to sustain the life expectancy and functionality of your shotguns. Got this kit as prize on one of the shotgun competitions. The most compact shotgun cleaning kit in this review. The Beretta Shotgun Cleaning Kit contains a collection of all the essential tools and accessories that are necessary for cleaning a Beretta or any other shotgun. The kit includes a cleaning rod handle with aluminum rods, a wool mop with yellow cotton patches, bronze brushes, lubricant oil, and a utility nylon brush. With these tools, you can clean any 12-gauge or 20-gauge shotgun with them. The kit was manufactured by Beretta which is the same company that manufactures the Beretta shotguns. Therefore, this is very good cleaning kit that you can trust to clean a Beretta shotgun. Of course, if you have a different brand of shotgun other than a Beretta, you can still use the Beretta Cleaning Kit to clean the shotgun just as long as it’s either a 12-gauge or 20-gauge firearm. Since most people own a shotgun with one of these two gauges, then it shouldn’t be a problem for you. In fact, you could use the cleaning kit to clean multiple shotguns that you own as well. If you are interested in purchasing the Beretta Shotgun Cleaning Kit, it is available at most sporting good retail stores. This includes offline brick-and-mortar stores and online e-commerce websites. The Beretta website has a product listing page for their Beretta Shotgun Cleaning Kit, but it is currently out of stock on their store. That is okay because they charge $28 for their kit anyways whereas Amazon’s product page has it listed for only $22.77. Plus, the cleaning kit is currently in stock on the Amazon product page. Therefore, you’ll get it cheaper through Amazon and it will be available to ship as soon as you purchase it. That way, you won’t have to wait weeks for a back order of the cleaning kit to get shipped to your address. Instead, it will get shipped right away without any delay. And if you spend over $49 on Amazon when you purchase the cleaning kit, you can get free shipping for it too. Once you get the cleaning kit, you’ll be able to preserve the functionality of your shotgun and ensure that it functions reliably and smoothly the next time you shoot at a target. 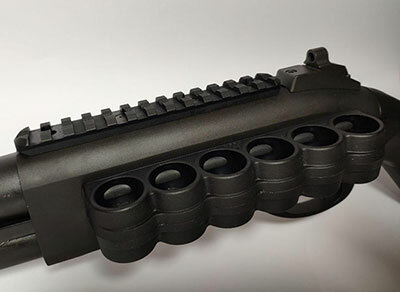 Best of all, you can increase the lifespan of the shotgun without having to worry about purchasing a new one for hundreds of dollars when it stops working like it used to. Bought this kit on one of the shotgun competitions when I found out that I have forgotten my shotgun cleaning kit at home. It is very good kit but box is pretty big. Tetra is a company that specializes in manufacturing and selling cleaning products. There three main types of cleaning products are for bikes, boats, and guns. The Tetra ValuPro III Shotgun Cleaning Kit is just one of their cleaning products that are designed to clean shotguns. This particular kit contains Tetra Gun Grease, a silhouette pistol extension, a cleaning rod, a patch bolder, cotton patches, and a bronze brush. The great thing about the Tetra ValuPro III Shotgun Cleaning Kit is that it gives you a versatile and high-quality solution for cleaning just about any type of shotgun out there. It doesn’t even matter what the gauge or caliber of your shotgun is either because the Tetra ValuPro III Shotgun Cleaning Kit is available for virtually any gauge or caliber. So, if you have multiple shotgun types that need cleaning, you will surely find any number of Tetra cleaning kits that are made specifically to clean them. The investment you make into a cleaning kit will be an investment in preserving the lifespan of your shotgun. With all the residue and debris buildup that occurs each time you shoot your shotgun, you cannot afford to just neglect the cleaning of your shotgun any longer. Furthermore, the Tetra ValuPro III will also lubricate the metal components of your shotgun to ensure they function smoothly and without any delay. This will help increase your shooting experience, timing, and the overall reliability you would expect from using your weapon. The cost of a Tetra ValuPro III Shotgun Cleaning Kit averages about $19.99. For that, you get both the cleaning tools and a reusable compact storage case to keep them all secured in. When you go to the Amazon product page for the cleaning kit, you will be given the chance to selection which gauge you want the cleaning kit to be compatible with. Right now, they have 28 gauge, 20 gauge, and 410 gauge available. The 20 gauge is priced at $11.73, the 28 gauge is priced at $12.77, and the 410 gauge is priced at $22.80. 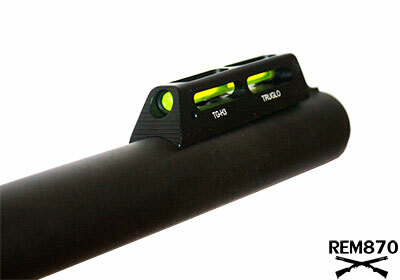 Tetra does make cleaning kits for the 12 gauge, which you probably know is the most popular shotgun gauge that is used. So, keep checking back on Amazon to see when the inventory for the 12-gauge cleaning kit is available again. You can also find them available on Tetra’s online store as well. This kit was recommended to me by a friend. Good kit for those who just bought a shotgun. Hoppe’s 9 is a gun cleaning product brand that you should look out for the next time you want to clean your 12-gauge shotgun. The Hoppe’s No. 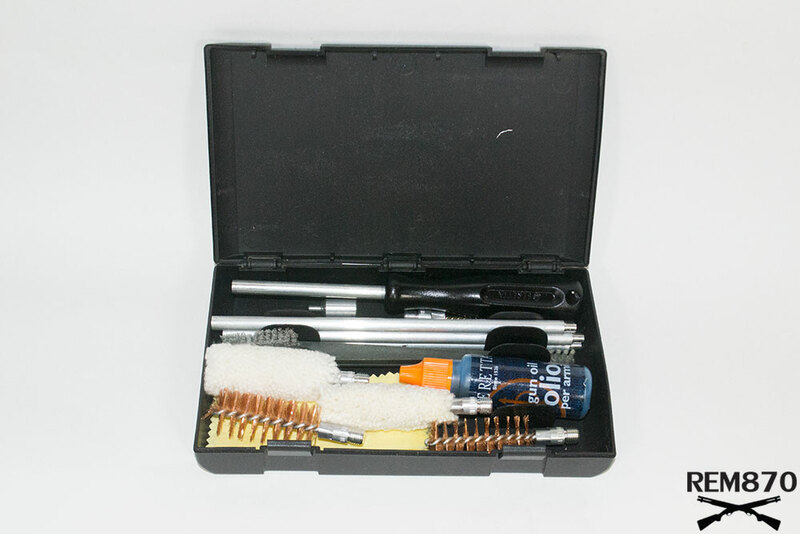 9 Cleaning Kit with Aluminum Rod with included spiral brush is the preferred cleaner of shotgun owners because it cleans all the crucial areas of the gun thoroughly. 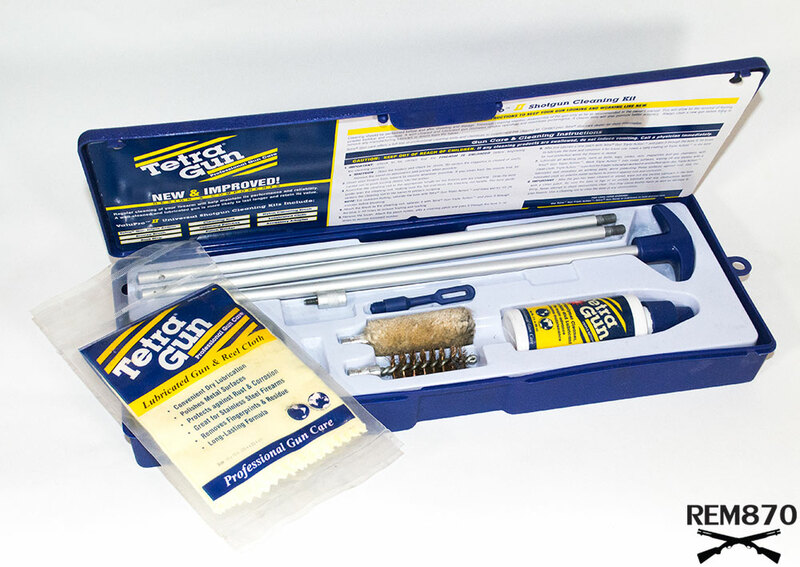 This cleaning kit includes a gun bore cleanser, an aluminum rod with patches, a lubricating oil and cleaning solvent. There is even a brush included which is designed for cleaning a 12-gauge. So, if you own any type of 12-gauge shotgun, this cleaning product will be compatible with it. Do not worry about the brand of your shotgun because that does not matter as long as it’s a 12-gauge shotgun. If you need a cleaning product for another gauge, Hoppe’s has cleaning products available for those too. The Hoppe’s No. 9 Cleaning Kit was designed specifically for both competitive shooters and hunters because they use their shotguns frequently and this causes residue to build up inside of it. Nasty residue like metal-fouling, lead, rust, and gunpowder are things that will build up over time unless you clean your shotgun frequently. With the Hoppe’s 9 Cleaning Kit, it will remove all these particles out of your gun so that it can function the right way. The high-viscosity oil included in the kit is perfect for cleaning because it doesn’t expire or harden like some other cleaning oils do. Not only does this give the kit a long shelf life, but it keeps your shotgun clean for longer periods of time as well. Instructions are inside the kit which walks you through the steps of how to apply the oil onto the shotgun and brush it properly. When you go to the product page on Amazon.com, two things you’ll notice right off the bat are its great reviews and affordable price. At only $9.90, you can’t find a quality gun cleaning product for a better price than this. This is perfect for those who must clean their shotgun often because they shoot it often. If you are too cheap to make this kind of investment, think about the investment you’d have to make if you let your shotgun get too dirty. It could end up misfiring or malfunctioning in some way that will damage the parts or components of the weapon. Then you’d have to spend hundreds of dollars replacing those damaged areas. In some cases, you would have to purchase an entirely new shotgun altogether.